Barrington Borough Council members Maureen Bergeron and Wayne E. Robenolt took the oath of office Sunday at borough hall after winning re-election to their seats in November’s election. 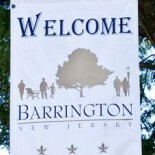 The annual reorganization meeting also included political appointments, remarks from visiting officials, performances by the Barrington Band and the confirmation of Jose Rosado Jr. as a police officer in Barrington and David Ehrman as the borough’s new fire chief. Councilman Kirk Popiolek also was unanimously re-elected to his position as council president. Among the guests at the event were Assemblymen Gilbert “Whip” Wilson and Angel Fuentes (who swore in Robenolt), Camden County Freeholder Director Louis Cappelli Jr. and Camden County Surrogate Pat Jones (who swore in Bergeron). Municipal prosecutor: Daniel Long, Esq. Public defender: Charles Wigginton, Esq. This entry was posted on January 6, 2014 by Barrington Bulletin in Borough Hall and tagged reorganization.